The year 1937 proved to be a significant one for Burnley when the club offered a trial to a 16-year-old from the North East of England, from Hetton-le-Hole to be exact. Little could anyone have ever known just how much of an influence this youngster would have on Burnley Football Club almost a quarter of a century later. That youngster went by the name of Harry Potts and travelled down for a trial game against Blackpool. Thankfully he did well and was taken onto the groundstaff before being given his first professional contract when he reached the age of 17. Harry established himself in the reserve team and by 1939 was thought to be ready for a call up for the first team. But his career, and that of many other footballers, came to a halt with the outbreak of war. He served with the RAF in India but returned to Turf Moor in 1946 after the end of hostilities and was ready for his football career. And that career started when he was named in Burnley's team for the opening day of the 1946/47 season. For over four years he was a regular choice in the side at inside forward. In that first season he scored no fewer than seventeen goals as Burnley won promotion to the First Division and reached the FA Cup Final at Wembley, our first ever appearance at the stadium. During this time he formed a superb partnership with Billy Morris, the other inside forward. Morris was the more attacking player whilst Potts was far more adept when it came to defensive duties. He did though have a reputation for winning penalties and free kicks and it was often joked that Harry could be fouled just outside the centre circle and had the ability to dive so far he'd find himself going down in the penalty box. He was always known as the general of the side that won the promotion and established itself so well in the first division. He missed just twelve games in the first three seasons after the war and in the fourth was an ever present. We'd changed manager, with Frank Hill replacing Cliff Britton, and in the end it was that change that brought Harry's departure from Turf Moor. Because of the war his football career had started late and in October 1950 he had just celebrated his 30th birthday. He became unsettled at Burnley and it was down to Britton, his Turf Moor mentor. He was now manager at Everton and came in with a record £20,000 fee to take Potts to Goodison Park. The move never really worked out for Potts. He went straight into the side but in his second season was struggling to make the first team and he doubled up by starting coaching some of Everton's junior players. He made just 59 league appearances for the Toffees, scoring fifteen goals, and was finally released at the end of the 1955/56 season. 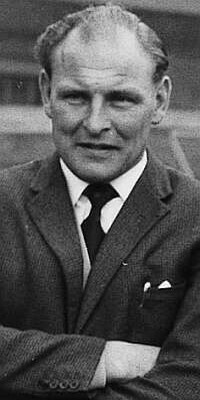 From there he coached at Wolves for a year before becoming Shrewsbury manager in the summer of 1957. That was to be for just a few months only because in January 1958 he was head hunted by Bob Lord and returned to Burnley as manager. He brought great success to the Clarets during that heady period before becoming general manager and then moving on. He managed Blackpool for a while and then returned to Burnley as chief scout before again becoming manager. He left in October 1979 for the last time and his last job in football was scouting for Colne Dynamoes. Harry Potts sadly died in January 1996 after a long illness. The funeral cortege stopped outside Turf Moor where both sides of the road (later to be renamed Harry Potts Way) were lined three and four deep on either side. He'd stamped his name in Burnley FC folklore and there is no doubt the name of Harry Potts is one that will never be forgotten as long as there is a Burnley Football Club. If you want to read more of Harry's time as manager of Burnley Football Club then please visit The Managers section of the site.